Raz is in the process of convincing his youngest sister to leave home and join a coven with him, and because of some half-acknowledged superstition he'd rather have a three-person coven than a two-person one. As such, he's rather warily looking for a third - his only experience with a coven so far has been with his mother and sisters, and that wasn't the best experience so he's a bit gunshy. The witch (powers open) that gains Rasmus's is in his twenties. He's tattooed and laid back and generally a nice guy. 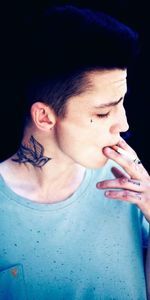 His suggested face is Ash Stymest, and we're going to call him Fred but the name's completely open. A lot of things are really open for discussion. In addition to finding him an acceptable magical partner, something about Fred sparks Rasmus into matchmaking mode. Fred is genuinely a nice guy, and so Raz decides to try fixing him up with his baby sister. No guarantees there, but Raz really wants Calliope to be happy and thinks Fred might be able to deliver on that front! Give me a poke if you have any questions!